Among the various techniques possible, following several consultations between the Pilosio Spa technical studio and the Cossi Consortium – LGV, the option chosen was to remove each span in its entire form, lowering it to the ground where it would be demolished and removed. 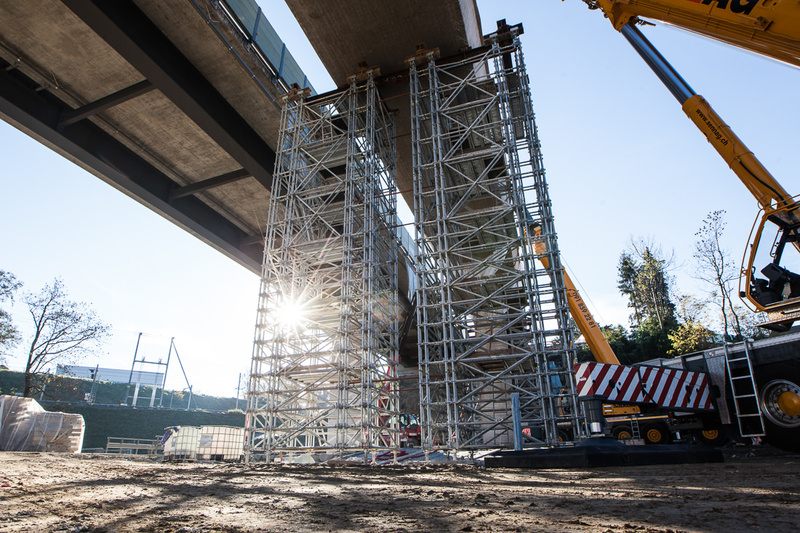 Each span was supported by cables fixed to two large steel beams and lowered by a system of hydraulic jacks: all the load was supported by four MP Pilosio multidirectional system heavy duty towers. 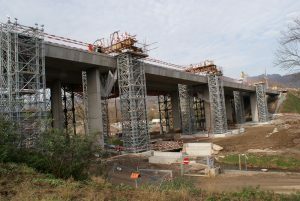 Four heavy duty towers were supplied, constructed in pairs, for the sides of each pillar of the existing viaduct with a loadbearing capacity of 100 tons each. The towers were not restrained at the top but restrained only to the ground by means of temporary foundation plinths, made to measure for the towers and built specifically for the function of support and anchorage. 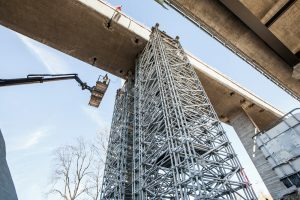 The tower pairs were connected to each other by a system of small, medium and large steel beams, in order to distribute the weight of the concrete span evenly on each of the eight columns of the two towers. 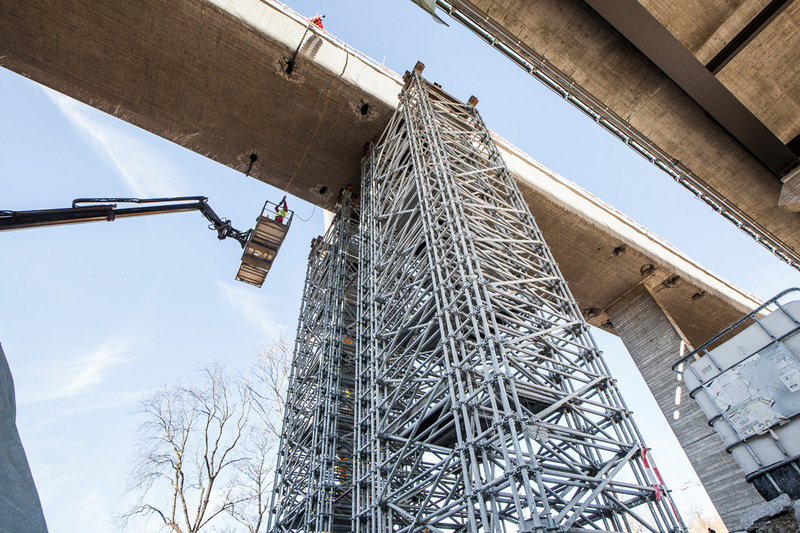 The large upper beam served to support the suspension system and hydraulic jacks for lowering the span to the base of the pillars. The lowering phase of each span was carried out over approximately 10-12 hours. More than a few difficulties have been overcome by the Pilosio technical team in the design phase: elevated heights, the need to design the towers without top restraint, the high loads and, last but not least, the presence of considerable wind on both the tower as well as on the structure to be demolished. "The Pilosio standard HD (heavy duty) tower, is made of 4 columns (each formed by four vertical MP uprights connected to each other) and has been sized up to a maximum height of 10 m, taking into consideration the fact that the wind on the MP structure alone has a horizontal load equal to 1% of its own weight. According to this configuration, the expected loadbearing is equal to 464 kN, "said the designer of the Pilosio technical team. 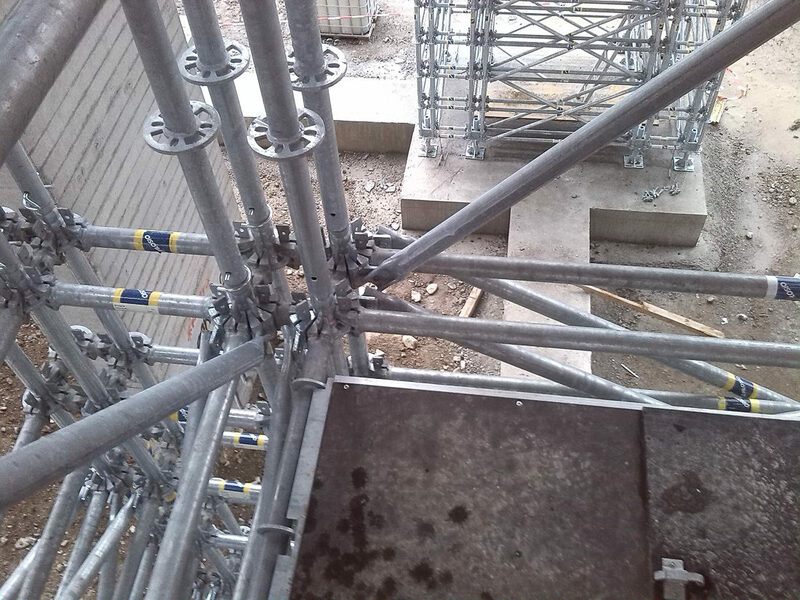 “However the tower designed for the Consortium Cossi-LGV is provided with a 2x2 m base with an extension of 50 cm on 2 sides, for a total of 8 columns (each of which is always made up of 4 uprights). 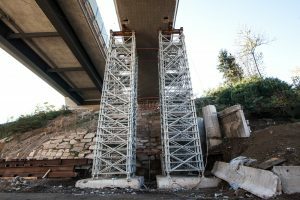 Despite the considerable height (18 m), the increase of the vertical load to 1000 kN and that of the horizontal up to 2.5%, in addition to a wind load concentrated on the summit equal to 22 kN (due to the effect of the viaduct), the heavy duty structure has reacted really well. Thickening of the diagonals, of 1m span, and of the crossbeams, of 50 cm span, for the first 6 m and for the last 4 m. The number of diagonals themselves was also increased up to 4 per side for each level (in place of the standard configuration of 2). In this way the most stressed areas have been adequately reinforced in order to respond well to the considerable anticipated loads. Remembering that the tower was to be left free at the top (no restrains), “concluded the engineer. Compared to an alternative solution in structure work, the MP system allows for maneuverability (handling for transport and assembly) of reduced loads: the MP elements are in fact very light and their assembly very simple and fast. The tower has been designed with a base of 2x2m to also allow the positioning of steel decks and access decks on the inside, making its construction completely safe, it being possible to always remain on the inside, something which is very difficult to achieve with a structurework solution. The towers were mounted in a day. In total 8 heavy duty MP HD towers were built at a height of 18m, as well as 2 at a height of 12 m for the removal of the side spans near the abutments. 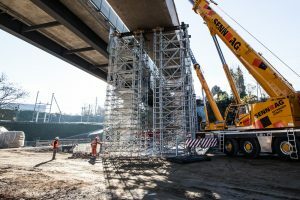 After the removal of all the supports for the viaduct, the MP system is then to be used in a “normal" configuration as scaffolding for the positioning of the new viaduct. 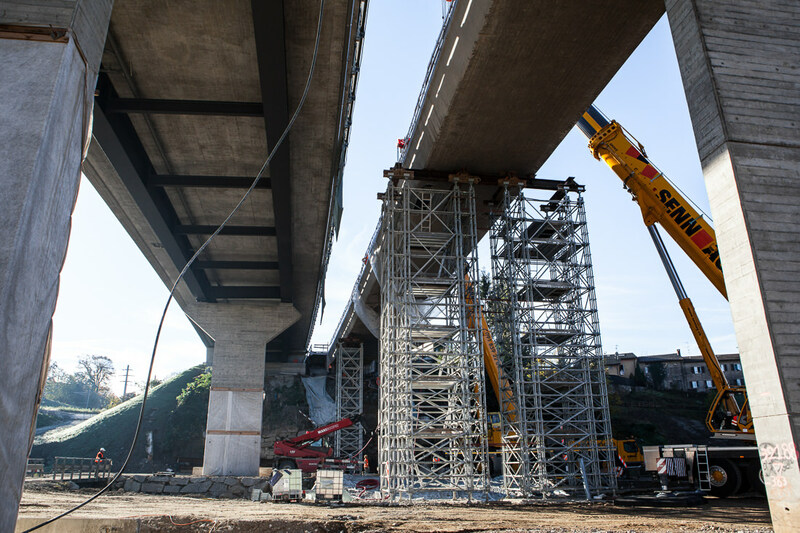 The new viaduct is to be made with a supporting system in mixed concrete / steel consisting of 2 + 2 supporting beams (h = 1.8 m) which support a concrete header cast in situ. The production and assembly of the steel supporting structure of the new viaduct are the work of the Consortium Workshops Ghidoni SA - Steelworks Cattaneo SA.